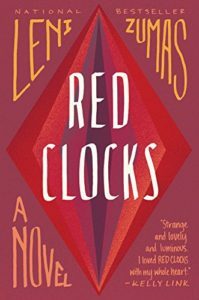 It has been a week or two since I finished Red Clocks by Leni Zumas, and I am still trying to decide what I thought of it. Red Clocks fits into the new wave of feminist dystopia, joining books like Vox by Christina Dalcher (reviewed here) in warning readers about the dangers of a world where women are silenced, demoted and deprived of their rights. In Red Clocks, a conservative administration has passed the Personhood Amendment, making it illegal for women to have abortions and outlawing IVF and adoption by single women or gay couples. Zumas tracks four women living in Oregon: an unhappily married mother of two, a single woman in her early 40s trying to conceive on her own, a pregnant high school student, and a woman who lives in the woods and provides herbal remedies to people in pursuit of untraditional (and illegal) medical help. Through the unique lenses of these four women, Zumas explores the experience of being a woman – a mother, a daughter, a professional – and in particular a woman whose options are increasingly limited. Zumas’ writing is sharp and real; she pulls no punches when it comes to the details – often unpleasant – of these women’s lives. It’s pretty bleak in the world of Red Clocks. As a result, this isn’t the most uplifting read. I am glad I read it; I can’t say I enjoyed it that much. But I think it’s important to read books like Red Clocks – you’d be surprised by how realistic it all seems. (Which is scary.) Imagining a very bleak world that isn’t all that far off is a good reminder of the need for vigilance and action in defeating such a misogynistic agenda. I listened most of Red Clocks on audio. It’s narrated by Karissa Vacker and Erin Bennett, and I am embarrassed to say that until now I didn’t realize that there were two narrators. They do a good job of conveying the urgency and futility of the women’s situations. The audio is a little confusing because although the women have names, they are unnamed in their own chapters, and are instead called “The Wife”, “The Daughter”, “The Biographer” and “The Mender”. Sometimes it’s hard to tell whose story you’re hearing. I ended up finishing this book in print, thanks to a hotel stay when I was under the weather, and in the end I preferred the print.